This month Guitar Planet celebrates the 25th Anniversary of Metallica’s definitive statement; the incomparable Master Of Puppets. March has proved a pivotal month in music history, playing host to a string of revered albums that are often labelled the greatest of all time. In March of 1973 Pink Floyd unleashed their all encompassing commercial juggernaut The Dark Side Of Moon while March of ’94 saw Trent Reznor return with The Downward Spiral; an album which set the stylistic template for a generation of anti-authority alternative icons in the US. Bob Dylan used March of ’65 to distance himself from the folk community with the enthralling and electric Bringing It All Back Home. On this side of the Atlantic Iron Maiden offered a definitive statement of their own, The Number Of The Beast; a record that is widely considered to be both Maiden’s and metal’s greatest. Metallica appeared to have put the turmoil of their early years behind them when, in 1985, they entered Copenhagen’s Sweet Silence Studios to record Master Of Puppets. Up until that point it had been an uphill struggle for Lars Ulrich and James Hetfield. Set the clock back four years and being in Metallica was not remotely cool and the Bay Area was yet to become synonymous with thrash. California was ruled by emerging hair metal icons Motley Crue and a (then) waning Van Halen. American metal in 1981 was glossy, hedonistic and sexist, residing predominantly in the sterilized arena setting. Raised on the British and European metal of the 70s Metallica were a dirtier, sweatier and more aggressive proposition, fighting to be noticed on L.A’s underground metal scene. 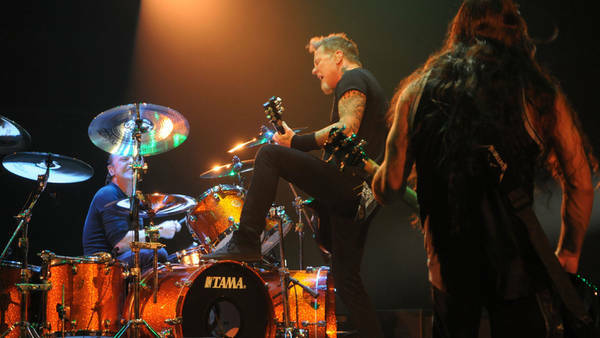 It didn’t take long for Metallica to outshine their peers and secure a record deal, unfortunately, while the band’s momentum grew exponentially so did the friction and internal tension within the band. 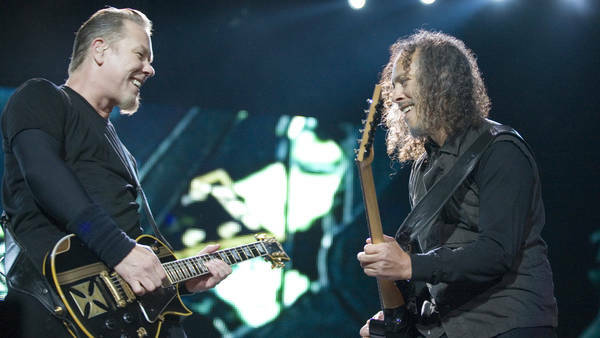 Dave Mustaine, the guitarist who wrote “Seek & Destroy’s” unforgettable riff along with five other Metallica classics, was becoming a major nuisance. He had already been fired from the band once (albeit only for one day) when he attacked Hetfield in retaliation for a kick the lead singer had dealt to his pet pooch. Mustaine’s behaviour only worsened, leading to his permanent dismissal in 1983; with the remaining band members citing his violent behaviour and substance abuse issues as the cause. The band quickly recruited their now iconic guitarist Kirk Hammett to fill the void and Metallica swiftly went from strength to strength. The release of 1984’s sublime Ride The Lightning saw Metallica win the battle with hair metal and having removed their unmanageable wild child; the only obstacle left in their path was the quite considerable and ever increasing weight of expectation. Metallica wrote and released what is widely considered to be the greatest metal album of all time. Master Of Puppets was not an album of innovation (Ride The Lightning provides a near exact template) instead it was an exercise in simultaneous refinement and expansion. The themes, the lyricism, the compositions, the movements, the hooks and of course the solos were more powerful and epic in scope than anything Metallica had previously recorded. Master Of Puppets was bookended by “Battery” and “Damage Inc.” two delicately composed but utterly relentless assaults of raw thrash punctuated by screaming, spiralling solos and Hetfield’s thunderous rhythm. Unlike Kill ‘Em All, Master Of Puppets was not a senseless beating. “Welcome Home (Sanitarium)” highlighted Metallica’s ever developing flair for subtlety with its winding hypnotic riff billowing out into a sprawling epic that mirrored Hetfield’s lyrical descent into/struggle against insanity. “The Thing That Should Not Be” and “Leper Messiah” posses an imposing muscularity but the assault is measured; employing churning groove laden riffs to create an oppressive but not overwhelming atmosphere. Hetfield’s eight minute plus ode to addiction “Master Of Puppets” provided the perfect centrepiece for the album. As a track “Master Of Puppets” encapsulates everything great about the album as a whole; it’s big, brutal and imposing, it’s layered and complex, complete with multiple changes in tone and texture, and most of all it’s irresistibly catchy. The album’s iconic title track set the thematic tone; Hetfield appears slave to addiction, powerless and oppressed. 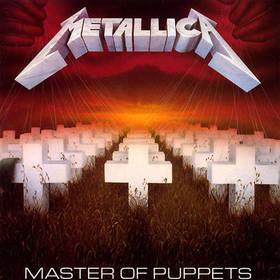 The ominous figure of “Master” looms large across the album as a whole; whether it’s the politicians sending young men to their death on “Disposable Heroes” or the unnamed creature of “The Thing That Should Not Be”; Hatfield captured in verse and Metallica in tone the feeling of bitter helplessness. Master Of Puppets proved sufficiently metaphorical, allowing fans across the world to transplant Hetfield’s master for their own. Whether it was your spiteful boss, your overbearing lover or even your nation’s detestable dictator; Metallica nailed the feeling, however rational or irrational, of subjugation. The end result was one of the most emotionally intelligent and affecting metal albums ever made. The metal world continues to live in the shadow of Metallica and Master Of Puppets. Listing their collaborative influence would be exhaustive and fruitless. One only needs to consider Trivium (one of contemporary metal’s most popular bands) whose career has been continually stifled by unfavourable comparisons to Metallica. Few albums resonate so strongly that they can headline a 90,000 capacity festival in their own right; but that’s exactly what Master Of Puppets did when Metallica played the LP start to finish on its 20th anniversary at Donnington Park. The metal community may never agree on a single Greatest Album Of All Time but Master Of Puppets certainly fits the bill. Marrying quality to popularity, scale to intensity and importance to influence; Master Of Puppets is the benchmark against which all new metal albums are measured.